Kelsey Crowley is an associate at Caesar and Napoli. Ms. Crowley is admitted to practice law in the States of New York and New Jersey as well as the District of Columbia. 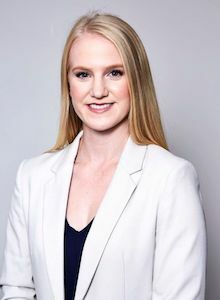 She has represented injured victims of motor vehicle accidents, pedestrian accidents, construction accidents, workplace injuries, general premises liability, wrongful death, actions against municipalities, defective products and insurance coverage disputes. Ms. Crowley holds a J.D. degree from Pace University School of Law and a B.S. in Environmental Polices and Science from Rutgers University. During law school, Ms. Crowley held several public internships, including with the New York City Mayor’s Office of Environmental Remediation and the United Nations. Ms. Crowley also interned at Caesar and Napoli, P.C. while attending law school. Ms. Crowley is a member of the American Association for Justice, the New York State Trial Lawyer’s Association, and the New York State Bar Association.